Looking for a peaceful, private retreat in the Smoky Mountains to get away from the stress of everyday life?! The Lily Pad is the perfect spot to toss those worries aside and let the quiet tranquility of this beautiful setting put you right at ease. 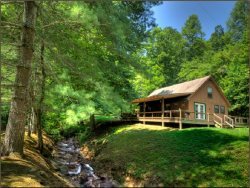 The Lily Pad is a three bedroom, 1.5 bath cabin located just five minutes outside of Bryson City, yet you feel away from it all. When you arrive, you cannot help but immediately relax. This secluded home sits all by itself on a beautiful rushing brook and has a private pond, filled with lily pads - hence it's name. Enjoy a quiet morning sipping your coffee on the wooden swing by the creek, rock your cares away on the covered porch, enjoy a nice peaceful campfire, or take a soothing dip in the hot tub - the choice is yours! Once inside, you can relax on the new leather living room furniture while watching television with satellite service, you can cook a delicious meal in the fully stocked kitchen, or you can eat a nice meal as a family in the ample dining space with large dining table and eat-in bar. There is ample room for sleeping for you and your party - either large or small. The master bedroom is located downstairs, equipped with a king-sized bed. The second bedroom is equipped with a full sized bed, and the conveniently located bath has a tub/shower combo. Upstairs is a sleeping loft, which holds two full sized beds and there is an additional half bath. For guests convenience there is a, charcoal grill, washer/dryer. The Lily Pad is located within a five minute drive to downtown Bryson City, home of the Great Smoky Mountain Railroad. Take advantage of the many delicious local restaurants and shopping opportunities while in town, you're sure to find several local favorites. Located within a 10 minute drive you will find Fontana Lake and the Deep Creek Community, where you will find many opportunities for hiking, biking, swimming, fishing, tubing,and horseback riding. The Cherokee Indian Reservation, Harrah's Cherokee Casino, and the entrance to the Great Smoky Mountain National Park are located just a short 15 minute drive away. If you are looking for more heart pounding outdoor adventure, take a 20 minute ride over to the Nanatahaha River Gorge where you will find world-renowned whitewater rafting, kayaking, hiking, fishing, ziplining, and horseback riding. Three bedroom, 1.5 bath - sleeps up to 8 people. Located creekside, private with lily pad pond. Hot tub, fire pit, covered porch, charcoal grill. TV with satellite service, basically equipped kitchen, washer/dryer, pet friendly. Has window unit a/c. The cabin was beautiful and secluded. Property was lovely, had a lot of space. Nice & quiet, we were able to relax & enjoy the country. Staff was very friendly and helpful. Had to make a change, no problem. Stayed at the Lily Pad, loved it, Had everything we needed, close to town but still secluded. No problems, great time. The staff is comprised of the sweetest and most knowledgeable folks you will ever deal with. They go out of their way to assist everyone. I have been dealing with them for 20 years and I am crazy about them all. They have helped me to enjoy some wonderful stays in many of their properties. Hats off to all of them!!! Wonderful, peaceful, easily accessible to town and all the places we wanted to go. Could not have asked for more!!!! The rep on the phone when we booked the cabin was really friendly . Team members were super nice and helpful via phone and email. Immediate responses via both sources. we really only dealt with the staff via email, and this was extremely easy. staff was responsive quickly to any questions we had and there were no concerns before, during, or after our stay. My husband and I were looking for a short getaway for our anniversary and we were hoping for something cozy and private that felt like we were truly "unplugged" without "unplugging" from electricity. We felt like this was the perfect answer. cabin in the woods, but still like a comfy house... still reachable by phone for our daughter... but never feeling like the world was imposing on our break. when we needed groceries or wanted to go out to the mountains it was a short ride, but when we came back to the cabin we felt truly tucked away. really appreciated the ability break away like this!